The fact that Japan forbids the use of benzoic acid as a preservative in chilli sauce while Viet Nam allows it does not indicate the country’s slack food safety standards, Viet Nam’s food administration said. 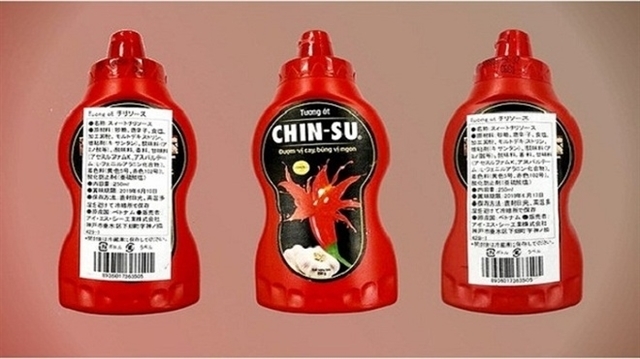 Made-in-Việt Nam Chin-su chili sauce products with Japanese labels on the back. Việt Nam is currently following international food standards, or FAO/WHO Codex Alimentarius, which developed nations such as the US or European countries are also observing, the agency said in an official document it sent on Thursday to Việt Nam’s Masan Group, following reports that Japan ordered a recall of the company’s 18,000 Chin-su chilli sauce bottles, a popular product in Việt Nam, for using benzoic acid. The bottles reportedly were brought to Japan by an Osaka-based company but Masan said it had never given rights to export any of the products to Japan. Japanese authorities’ recall, combined with the label “Exclusively for sale in Việt Nam. Exports are not authorised” on the bottles in question, have triggered public concerns that Vietnamese food safety regulations are severely lacking. “The fact that Japan has yet to list benzoic acid or sorbic acids as permitted additives in chilli sauces doesn’t mean these substances are banned in food, as Japan allows them to be used in caviar, margarine, soy sauce, or non-alcoholic beverages,” Việt Nam food administration claimed. According to the agency, benzoic acid or sodium benzoate are accepted preservatives in chilli sauces, but the maximum amount is capped at 1,000mg per kilogram of the product, according to two circulars by the health ministry issued in 2012 and 2015, which fall in line with Codex’s regulations. Osaka’s public health centre determined the amount of benzoic acid in Chin-su chilli sauces at 410-450mg per kilogramme, well below the cap. The agency also said that the producer is not required to carry warnings on the use of these substances in their chilli sauce products but must clearly state them under the ingredients list. Speaking to Nhân dân (The People) newspaper, Trần Việt Nga, deputy head of the agency, asked the public to “calmly” listen to the health agencies and not to be overly alarmed.